Starting from the previous article, Zhenheng series to explain the common types of concrete mixing station failure, fault handling methods. 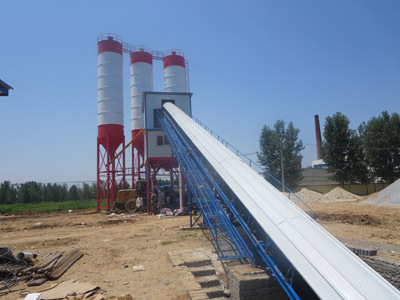 Mixing station of various components of the machine (concrete mixer, batching machine) common faults and maintenance. Symptom: In the automatic production process, one or more aggregate said in the measurement bucket, do not discharge, the system stops running. 1, to be hopper door is not in place. 2, weighing instrument does not discharge the output signal. 3, the belt machine is not started. 4, aggregate said fine door is not in place. 5, aggregate must define the discharge order. 1, check whether the bucket valve is expected to be closed or not in place. 2, check the aggregate weighing instrument is unloading output signal. 3, check the belt machine is started. 4, check the aggregate of fine door is closed in place. Symptom: After the mixer is started normally, press the beveled belt start button on the console, and the oblique belt does not start. 1, the mixer did not start. 2, oblique belt maintenance stop switch is not reset. 3, oblique belt machine power switch is not connected. 4, oblique belt machine stop button switch is not reset. Next:What are the Common Faults of the Ingredients?